Today’s snippet is the start of a new WIP, tentatively titled ‘Starting Over’. Victoria moves to Oak Grove, a tiny town in north Texas, looking for a new beginning. From her quaint antique store on the town square, she encounters more drama than she ever expected. In the midst of getting to know her storekeeper neighbors and learning who she can and can’t trust, will she find the one thing she’s not looking for, true love? Stay tuned each week to find out. This week’s prompt is: Sea. Enjoy – and feel free to leave a comment. Click the link here to go back to the main Tuesday Tale site for more entertaining story snippets. The jingling bell above the front door caught Victoria’s attention, interrupting her task of sorting out silverware patterns. A blond god stood in the doorway, haloed by the golden sunshine behind him. His image banished all thoughts of spoons and forks. Well, not all thoughts. Visions of spooning and forking quickly filled her head, but they didn’t have anything to do with the piles of silverware scattered around on the table. When her extended hand was ignored, she dropped it to her side. Well! How rude. His golden image receded to a mere mortal, an ill-mannered one at that. “It depends on what you’re offering.” Victoria tried to keep a clipped tone out of her voice. He was still a customer after all, even if he was brusque and obviously didn’t believe in the art of small talk. “They’re in the car. I’ll go get them.” The visitor reached for the sunglasses perched on top of head and headed outside. Victoria edged towards the front window, curious as to which vehicle he approached. He was unlocking a sapphire blue BMW Roaster parked directly in front of Serendipity. A soft sigh escaped her lips. The perfect car to showcase such a handsome man. Good thing I’m not in the market for any man or I’d be like a swooning teenager right now. As he grabbed a dusty box from the trunk, his bulging forearms brought a flush of heat to Victoria’s face. She scurried back to the table filled with silverware, not wanting to be caught watching. The tinkling bell gave her warning to compose herself. “Here’s the dishes.” He sat the box on the floor next to Victoria’s well-worn sneakers. 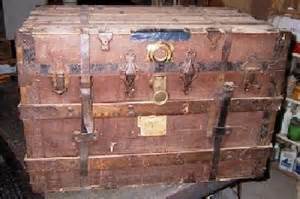 When he carried the old steamer trunk in, Victoria didn’t even care that he’d left mid-sentence. Seeing the vintage trunk, excitement bubbled up inside, even if it was marred by a tacky piece of duct tape. He opened the lid, hinges creaking the whole way, and Victoria could hardly contain herself. “Ohhh,” she gasped. She carefully sifted through the sea of treasures within. 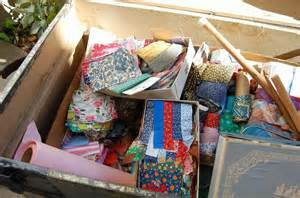 There were lots of cut out quilt pieces, all vintage calico fabrics, easily dating to the Depression era and possibly earlier. A few skeins of yarn looked handspun and precious. But the tattered box filled with photographs and letters was her favorite find. “That’s five hundred all together …” He paused, deep in thought. Victoria noticed that when he was thinking so intently she liked the way his blue eyes softened with little crinkles on the sides. He wasn’t quite as foreboding or ultra in charge. Victoria quickly made out a check, before he changed his mind. She wondered as she was writing it out – ‘Toby L. Burdett’ – why does that sound familiar? After completing Rosemary’s story last week, I was going to continue with the next ‘Posie’ in the group. But then … my flighty Gemini side kicked into high gear and urged me to try something new and outside of my comfort zone. Today’s snippet is the start of a new WIP, tentatively titled ‘Starting Over’. This week’s prompt is: Ride. To all outward appearances, Oak Grove was a small, bucolic Texan town. When she moved there, Victoria didn’t realize how much drama and deceit she’d encounter on the courtyard square. 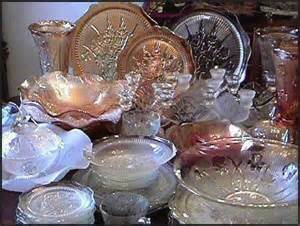 Victoria stood at the front window of Serendipity arranging a new display of Iris patterned Depression glass, one of her favorite designs. She stopped, holding the rare pitcher in hand, and gazed across the street to two fellow merchants standing near one another in an intense discussion. They probably didn’t think they were noticeable, hidden in the dappled shade of the oak trees lining the courthouse set in the middle of the square. They didn’t realize that the view from Victoria’s antique and collectible store had a front seat view of their secluded spot. From Victoria’s position near her window it appeared that Hank, the owner of Hank’s BBQ Grill on the opposite side of the square, and Jacqueline, the owner of the trendy clothing store next door, were very close friends. The intimate gestures – the way they touched each other’s shoulders and the way they held their heads so close to one another as they spoke – caused Victoria to speculate. She wondered if Hank’s wife knew about this obvious interest in Jacqueline. Now, she wondered if she’d made the right decision about running away to Oak Grove. But she couldn’t look back now. Every cent she owned had gone into this new business venture. She’d made all this effort to disappear and leave her old life behind, including the pilot and all of his lies. She had had to keep moving forward with her plan. Although, she had no intention to ever trust another man again. She thought that a new start in a quiet, non-descript town was the perfect solution. She’d spent weeks driving through dusty little burgs set far off the main roads and highways. Every chance she got, she’d jump in the car for a ride through the countryside. She found towns she didn’t know existed. Some were mere blips on the scenery, while others spread out and occupied more space. A few had silly whimsical names, such as Rhome and Ponder. 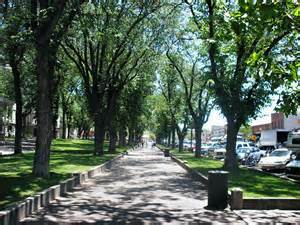 Others were a little larger, with the central part of town filling several blocks, such as Mineral Wells or Bowie. Most towns showed some promise for a new start. Yet they all had something lacking. Not big enough. Too big. Too far away. No prospects for commerce. Only a farming community. Too close to the highway. Nothing available. Great space but too expensive. Too flat, too barren. No atmosphere. And then she’d stumbled upon Oak Grove, nestled back in the country midway between Denton and Roanoke. It was close to Texas Motor Speedway, yet far enough away that the high traffic volumes shouldn’t impact the community. There was a small town square, with the common courthouse-in-the-middle configuration, encircled by small businesses on all four sides. Stands of post oaks and flowering crepe myrtles shaded the town, bringing relief from the intense Texas summertime heat. The neighboring town to the east, Bluebonnet Hills, was filled with huge 6 and 7,000 square foot McMansions accented with driveways full of Expeditions, Lexus’ and Jaguars. The homes there screamed ‘I’m rich! Look at me!’ The few miles of meandering road between the two towns kept the ostentatious lifestyle out of arms reach, yet Bluebonnet Hills was close enough that its residents regularly showered their money like confetti upon the nearby communities. The best part of the road trip on this particular day was the ‘For Sale’ sign hanging in the front window of Serendipity. All those years of haunting dusty bins at other antique and collectible stores could come in useful. Within 30 days the papers were signed and the store including its lease and all the merchandise now belonged to Victoria. A glimpse of Jacqueline striding across the street; her long dark tresses bouncing with each step, jolted Victoria back to the present. As Jacqueline passed by the front window, she jumped as she noticed Victoria standing there, a red flush spreading quickly up her neck and across her face.